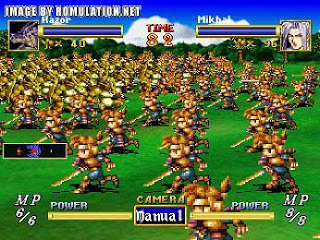 A couple months back I started playing Dragon Force on my recently purchased Sega Saturn and thought it would be a great review piece for me. Unfortunately I came across a couple problems when trying to type up a review for it. In short the Mini Review has been born. I will type up a separate article that explains the purpose for the Mini Review, but until then here is the first ever Just One More Level Mini Review. Dragon Force is a Strategy-RPG for the Saturn. Everything takes place on the world map and every town, city, fortress, etc are connected by dots that your generals (a.k.a. characters) travel across to go between place to place. 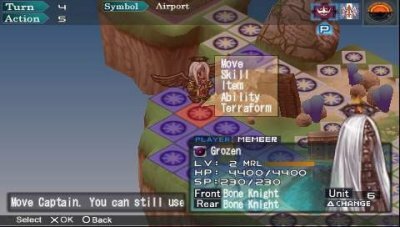 The game does not have a go from point A to point B game play style though. Now the only reasons you will be taken away from the world map is when a battle negotiation starts or the day is done and you need to handle domestic issues for your empire or generals. These basically serve the purpose of your status/support menus. I really liked how the game places you in the position of running an empire. With each general having his or her different personality and they all wanting to feel like you care about their existence in your military. If they feel like you aren't using them to their potential, whether not awarding them, giving the new items, equipment or sending them into battle, they will betray you the next time a battle starts, which you can't back out of once it starts. 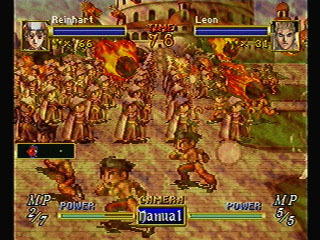 Working Designs really did wonders on this game by incorporating multiple ways to deal with your generals. Dragon Force has eight different nations that all want to control the entire continent and will stop at absolutely nothing to make sure that any entity in front of them is removed. This makes negotiations a real struggle. You always have the chance of the opposing side retreating from a battle if you talk with them first. The problem here lies in the fact that you only send your general to the front line to discuss the negotiation. If the opposing side does not feel the need to agree to your terms and retreat then...your general is all by his/her self. Meaning the battle will start and all you have on the battlefield is a single person. All generals will put up a fairly good fight, but the numbers game is impossible to overcome (unless you are dealing with rookie generals that only have ten to twenty troops under their command). This led me to avoid negotiations altogether after the first four or so times. Only because one of those times did the opposing side make the decision to retreat for the time being. The other three led to three generals dying on the battlefield and me being unable to bring them back. You have complete control over how your empire expands and strengthens. How quickly it grows and how many generals come under your command. I know its very late to the party. 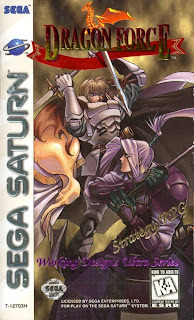 BUT, if you ever pick up a Saturn and want an excellent strategy-RPG for the system. Look no further than Dragon Force as it will eat up your free time very, very easily. Trying to build up your own nation, managing the domestic problems the people have, managing the fortress and constructing battle strategies will make you feel the pressure. Especially since all other nations are operating in real time, just like you and you can (and most likely will) have moments where you are being attacked from all sides. So managing recruits become very important as well to keep your generals ranks up and never no into battle with any disadvantages.